Homer called salt a divine substance. Plato described it as especially dear to the gods. Today we take it for granted; however, as Mark Kurlansky so brilliantly relates in this world-encompassing book, salt-the only rock we eat-has shaped civilization from the very beginning. Its story is a glittering, often surprising part of the history of mankind. Until about 100 years ago, when modern geology revealed how prevalent it is, salt was one of the most sought-after commodities, for without it humans and animals could not live. Salt has often been considered so valuable that it served as currency, and it is still exchanged as such in places today. Demand for salt established the earliest trade routes, across unknown oceans and the remotest of deserts: the city of Jericho was founded almost 10,000 years ago as a salt trading center. Because of its worth, salt has provoked and financed some wars; it was, as well, a strategic element in the American Revolution and the Civil War, among other conflicts. Salt taxes secured empires across Europe and Asia and have also inspired revolution (Gandhi's salt march in 1930 began the overthrow of British rule in India); indeed, salt has been central to the age-old debate about the rights of government to tax and control economies. The story of salt encompasses fields as disparate as engineering, religion, and food, all of which Kurlansky richly explores. Few endeavors have inspired more ingenuity than salt making, from the natural gas furnaces of ancient China to the drilling techniques that led to the age of petroleum, and salt revenues have funded some of the greatest public works in history, including the Erie Canal and the Great Wall of China. Salt's ability to preserve and to sustain life has made it a metaphorical symbol in all religions. Just as significantly, salt has shaped the history of foods like cheese, sauerkraut, olives, and more, and Kurlansky conveys, in his saga and through 40 historic recipes-how they have in turn molded civilization and eating habits the world over. 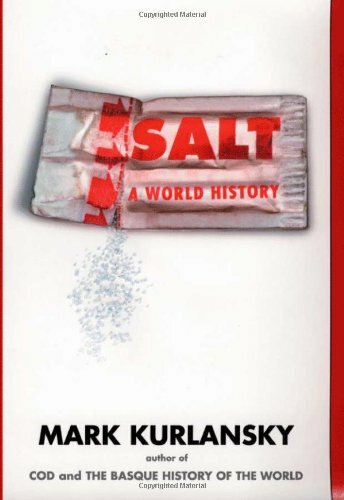 Salt: A World History is veined with colorful characters, from Li Bing, the Chinese bureaucrat who built the world's first dam in 250 BC, to Pattillo Higgins and Anthony Lucas who, ignoring the advice of geologists, drilled an east Texas salt dome in 1901 and discovered an oil reserve so large it gave birth to the age of petroleum. From the sinking salt towns of Cheshire in England to the ancient salt work in southern San Francisco Bay; from the remotest islands in the Caribbean where roads are made of salt to rural Sichaun province where the last home-made soya sauce is produced, Mark Kurlansky has produced a kaleidoscope of history, a multi-layered masterpiece that blends economic, scientific, political, religious, and culinary records into a rich and memorable tale.